Upgrading a 2009 (pre-Unibody) Mac mini 3,1 (Core 2 Duo 2.26GHz 4GB RAM) with a Crucial M500 SSD. To identify your exact model of Mac, go to EveryMac.com. First of all: It’s worth it if your Mac is around five or six years old. It makes a big difference in daily use for fairly low cost. Just one catch: Not all SSDs will always work as fast as you’d want. You need to be careful when choosing your brand, since many Macs built around 2007–2011 come with the buggy Nvidia MCP79 SATA controller. Those Macs will not work with their full 3Gbps link speed with a lot of current SSD’s, instead falling back to 1.5Gbps only. The bad combination might give you other issues as well. Even if you can’t get 6Gbps like modern machines, you’re still much better off with 3Gbps than 1.5Gbps if you have a choice. You can check if you have the MCP79 by going to the upper left hand corner Apple menu, choosing About This Mac, More Info, System Report and the SATA section. Here, you’ll also see the negotiated SATA link speed. SSD’s that have the Sandforce SF-2281 controller are most problematic, and the SF-2281 happens to be one of the most common ones. In short: Nvidia MCP79 + Sandforce SF-2281 = no good. The Kingston SSDNow V300 I chose for the White MacBook 4,1 has the SF-2281, but since the MacBook doesn’t have the MCP79 and doesn’t support 3Gbps SATA in the first place, there’s no issue. See EveryMac.com for your machine’s specs. The Kingston is a top-value Sandforce drive. However, the Mac mini has the Nvidia MCP79 controller, and after extensive googling I found out I couldn’t use the Kingston or other Sandforce SSD’s, at least not at maximum speed. Also, one of the most popular and reliable drives, the Samsung 840, was reported as having compatibility issues as well. This ruled out most SSDs for this machine, including Intels, Samsungs and SanDisks. OCZ was an option since they have a firmware update to fix the SATA 3Gbps issue even on their Sandforce drives, but their reliability record is appalling, so I went with the Crucial M500, regarded as reliable. The M500’s controller is a Marvell, and there were online reports of the M500 functioning full-speed with the Nvidia MCP79 controller. And yes, it works fine at 3Gbps, as you can see from the screenshot above. Installation went without a hitch and the old machine is now almost like a new box. While you upgrade to an SSD, it’s worthwhile to do a clean install of OS X while you’re at it, instead of cloning your old setup. Install the latest version your machine supports. This, again, can be found on Everymac.com. In my case, the Mac mini went all the way up to OS X Mavericks, while the Macbook got OS X Lion. The best how-to’s for actually changing the drive can be found in the Videos section of OtherWorldComputing’s site, complete with cheesy “OWC ROCKS!” hard rock soundtracks! All in all, two successful updates, giving a new lease of life for a couple of old Macs. Jon, I’m running a 2.26 Core 2 Duo GHz Late 2009 Mac Mini – so a bit different and I’ve done things in a different order. I upgraded to 8GB of RAM around 2 years ago. That made a huge difference when a browser is running multiple tabs – things like Google Maps especially. Before that I was constantly having to kill my browser to keep my machine running. I’ve kept my OS up to date which has been fine until Yosemite. It slowed down a little with Mavericks but nothing to complain about. Now my boot time is around 2m20s. It’s OK when up and running but not quite like it used to be. I tried clearing some space on the HDD, repairing permissions, deleting the PRAM and confirming the boot disk and restarting from there but no joy with the boot time. I’ve considered trying to go back to Mavericks but obviously I’ve ended up on this blog wondering if an SSD will be my saviour! Quite tempted by the Crucial MX200 500GB. Kiitos for this article, Tuukka. what i don’t understand is the performance of the speed… why 50-60Mb/s sometime??? the SSD go into SLEEP MODE??? Recently I did an SSD-upgrade on my Late 2009 Imac / Yosemite. I did a ‘Fusion-Drive Do-it-yourself’ with a 2 TB WD HDD. I installed the 256 GB Samsung 840 evo instead of the optical drive – but unfortunatly got the 1,5 Gb Link Speed. 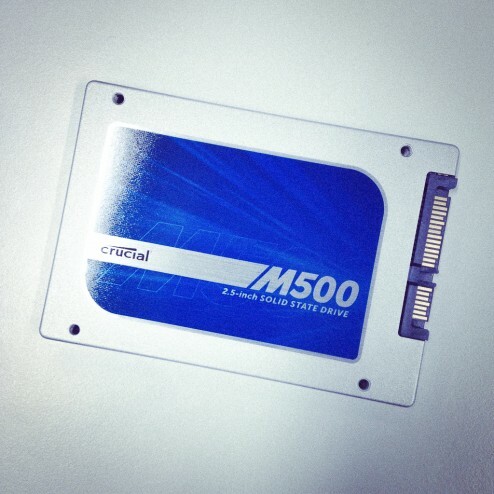 So after reading this very good post I changed to the 240 GB Crucial M500 and everything works fine. 3 Gb Link Speed from the very beginning and a very good performance on everything – like a new computer! I thought about the Crucial MX100 but there was so much praise here on the M500…and still on sale. I just wanted to say thank you for an extremely helpful post–I used this as the basis for my last upgrade. A friend upgraded, and gave me her old 2008 Unibody MacBook (5,1)–stock 2GB RAM, 160GB 5,400 rpm HDD and Leopard. I also enabled TRIM support through the Terminal sudo trimforce enable (supported in 10.10.4). MUCH better system; ~$150. Loving it. I had a similar issue with a 500GB MX200 in a 2007 iMac. Reads were fine at 260 but writes were down to 80MB/s. Now I’m getting 160MB/s and expect this to improve as I clear space to more than my hourly write load. If you don’t break legacy App compatibility; upgrade to the latest Yosemite release, enable TRIM and see how you go. I have a 2009 Mac Mini. The Samsung EVO 250GB gave me only 1.5Gb. I returned the Samsung EVO 250GB and ordered a Crucial BX100 250GB from a local webshop. It said on their website that this drive is compatible for the 2009 Mac Mini. Of course all 6Gb drives “work” but the negotiating speed is the culprit. When I installed the BX100 250GB I was disappointed because it also was set to 1.5Gb! I was on a chat with Crucial on their website and they suggested there must be something with “garbage collection” and to fix it I should take out the drive and let it stay connected to power only (no data connection) for at least 8 hours and the drive would fix itself. This sounded like a crazy solution but ok, I will try it. To my my amazement this really worked! I get at least twice the speed I had on 1.5Gb (209 MB/s write and 268 MB/s read on Black Magic Disk Test). So my conclusion is that Crucial SSD drives work with the NVidia SATA controller in the 2009 Mac Mini. I guess this should work also with other Crucial SSDs. I wrote on my last post about success with the Crucial MX100 250GB that got 3Gb on my Mac Mini 2009. But when I upgraded from Mavericks to Yosemite it fell back to 1.5Gb. After I installed Trim Enabler it went back then to 3Gb. But after the lateste OS X 10.10.5 upgrade it seems to have fallen back to 1.5Gb again! This is strange and I have to try the trick with the drive attached only to power for some hours again to see if it helps. I tried resetting pram, reinstalling Trim Enabler and other stuff with no luck. So I thought I would go for the power-only trick again and took out my Crucial SSD BX100 and let it stay on power-only for 8 hours. That seems to be the trick. It is now back on 3Gb! I wonder if any other drives would be fixed this way (like the Samsung EVO). Let me know! I Installed a Crucial M500 120G SSD on a 2009 Mac mini and it worked! Is it possible to put a 500 GB Samsung 850 into an early 2008 17″ MBPro 2.5 Ghz Core2Duo ? or is there a better SSD for this mac ? Or will any SSD be incompatible with this link speed ? thanks for this interesting post. I have an iMac early 2009. Four days ago I replaced the HDD with a SanDisk Ultra II 960 GB. When I ordered this SSD I didn’t know anything about these discussions about the negotiated speed with MCP79 but, in the end, I have probably been just lucky, because I can see a negotiated speed of 3Gigabit. In fact, as fas as I know this Ultra II has a Marvell controller, Marvell 88SS9189 to be precise. Overall I’m quite satisfied with the replacement: I can’t reach the SSD max speed of 500MB/s, because my iMac is not SATA3, but I can get to 200/260 MB/s (write/read) and the overall performance of my iMac has definitely improved. Had the same issue SSD compatibility issue on a Mac Pro 13″ 7,1 (MCP79 Nvidia chipset). Had an ancient 5400rpm sata drive on there, so ordered an SSD, and some ram. The SSD I ordered – a Toshiba Q300 256G, was almost unusable on it. Toshiba uses their own chipset. Drive negotiated to 1.5G link speed, but deathly slow, beachball timeouts. First thought it was cable or the south bridge, as those are common faults. Repaired /replaced those, then got 3G link speeds, but still no good on using the drive. Replaced with a Samsung EVO and all good. Bit of a pain in the rear, sigh. By the way, I mainly run off a Linux partition. In response to Ken: i am using a macmini3,1 with the MCP79 chipset, fresh install of OS X El Capitan 10.11.1 (15B42). Currently my Crucial BX100 is running only on 1,5GBit Link speed. I am looking into what to do about it, seems Firmware is current (MU02). can not really recommend it. i will see what crucial support has to say about this. Can anyone point me in the right direction. Trying to install esxi on a Mac mini mid 2010. The HDD is not recognised and the controller is an Nvidia MCP89. V1.3. I’ve tried a custom install with the MCP79 VIB but that does not work. Does anyone know of a MCP89 AHCI VIB file? I am also looking to install an SSD in a MacBook Pro 5,5 (mid 2009) with the NVidia MCP79 controller inside. Can anyone confirm which current SSD (Crucial BX100/MX200, Samsung EVO 840/850…?) will work at 3Gbps with the MCP79 controller? So, now i have also received an Email from Crucial Support telling me to disconnect the data lines and leave it running on power only for 6-8 hours. So i booted the mac and stopped it at the “Chosse you OS to Boot screen”, where there should not be any access made to the SSD. Left it Sitting for 8 Hours (and 10 hours on my second try). Makes no difference. Still 1,5 Gbps Link speed. can not recommend. hardware Involved: macmini3,1 (thats a late 2009) and Crucial BX100 with latest Firmware, MU02. Ich entschuldige mich für die Missverständig, dass ich glabte, dass Sie Sata 1 haben, und Sie bekommen 1.5 Gbps, und das ist die richtige Geschwindigkeit vom Sata 1. Aber jetzt besteht die Möglichkeit von den Fehlerbehebungsschritten, die Sie befolgen werden, damit Sie dieses Problem lösen können. Jetzt ist die Garbage Collection Tool zu empfehlen. Es gibt eine Funktion in unseren SSDs, namens „Active Garbage Collection“. Wenn Sie „Aktive Garbage Collection“ auf dem Laufwerk für einen längeren Zeitraum laufen lassen, werden diese Zellen gereinigt und wird die SSD zu ihrem gesunden Zustand wiederkommen. In SSDs ist diese Garbage Collection ein Teil der Steuerung und läuft während der Leerlaufzeit, um die Leistung nicht zu beeinträchtigen. Diese Bereinigung erlaubt einen schnelleren Zugriff auf die neu freigesetzten Sektoren. Lassen Sie Ihre SSD im Leerlaufzustand für 6 bis 8 Stunden. In einem PC: Entfernen Sie einfach das SATA-Kabel von Ihrer SSD und lassen Sie nur das Netzkabel angeschlossen! Nachdem Sie Ihren PC eingeschaltet haben, wird die SSD in einem Leerlaufzustand, aber immer noch mit Strom versorgt, so dass Garbage Collection funktionieren kann. Lassen Sie den PC für die 6-8 Stunden mit Strom versorgt! – Wählen Sie Ändern Planeinstellungen aus. – Wählen Sie Erweiterte Einstellungen ändern aus. – Sicherstellen, dass das ‘ Festplatte ‘ Feld auf “nie” ( Laptop-Benutzer wählen Sie ‘ Batterie und Netzteil ‘ ) gesetzt /markiert ist. Mit diesen Schritten wird die SSD mit der richtigen Geschwindigkeit funktionieren. Wir entschuldigen uns für irgendwelche Unannehmlichkeit. Wenn Sie weitere Fragen dazu haben, bitte zögern Sie nicht uns zu kontaktieren. Further Emails with Crucial Support will follow. Got good experience (and about 200 MB/s write and 267 MB/s read on Black Magic Disk Test) with Nvidia MCP79 AHCI >> Link Speed: 3 Gigabit on my and my Samsung SSD 850 EVO 250GB in my MacBookPro5,3 (Mid 2009). I would like to change the 2,5″ Hitachi Sata HDD in my late 2009 Macbook for a Sandisk Ultra II 480Gb SSD. Would this work & improve performance? Any experiences with this 2009 Macbook & SATA-III SSD? Which of these drives will have optimal performance for my laptop. 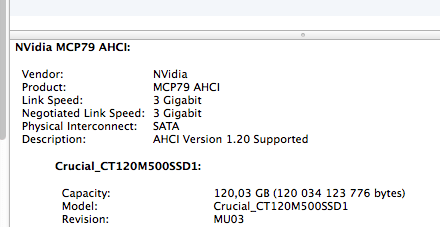 I have an early 2009 iMac with NVidia MCP79 AHCI rated at 3gig speed. Which SSD upgrade is most likely to retain the 3gig speed? I thought Samsung is the best. Mac Mini 3,1 (late 2009) runs fine at 6Gbps with a Samsung 830 256GB SSD. My wife has an old 2008 unibody Macbook (5,1) with 8 gigs of RAM and I replaced the dead hard drive with a Crucial V4 256 Gb SSD that I had laying around – dead slow. Takes forever to boot and spinning beach balling all the time. So I bought a Kingston Hyper X 240 Gb SSD and no difference – it was almost worse. When I put the SSD’s in a external closure I was able to boot just fine and everything worked snappy – so clearly the problem was not with the drives them selves. When I tried to install OS X on the Crucial SSD it took – drums please – a week (I’m not lying). I’ve come across a lot of 2011-2012 MacBook Pro’s with faulty SATA-cables (that had similar issues) so I decided to replace the SATA-cable. Didn’t fix the problem. Then I tried putting an old hard drive that I found (that had OS X installed) and boom – everything worked just fine. Then I started looking in to things and found out that both SSD’s had the Sandforce SF-2281 controller and the MacBook had the Nvidia MCP79 controller. So theres your problem. Went ahead and bought a Samsung 850 Evo (MacBook sees it as a 3 Gb SATA II drive) SSD and the MacBook is snappy. My wife also complained that the MacBook didn’t come with a backlit keyboard. I checked and there was a connector on the logic board, so I ordered the backlit module and installed it (a hassle when you have to take everything apart). Now the wife is happy. Hi all, finally my Mac mini 3,1 late 2009 with SSD OCZ TRION 150 is running at 3GB !! So you can consider the OCZ TRION 150. Hello, thanks for this information-loaded post which was, by the way, one of the clearest ones I managed to find on this issue. I acquired a Samsung 850 EVO 250gb for a mid-2009 MBP 17″ without any shadows of doubts about compatibility issues, thinking that ‘all ssds are compatible’.. how wrong was I 🙂 Everybody keeps praising the Samsung EVOs but all I’ve got so far was a hanging El Capitan (scratch) installation process and a kilometer long error log. Now I’m trying the last thing to do – updating the old hdd to el capitan first, maybe that leads to something. The ssd disk works fine in an external casing but the problems start as soon as I connect it at the internal SATA cable. Apparently the Crucial BX or MX ssd’s are the ones to try next? Running a white macbook late 2009 (6.1, A1342), intend to install a EVO 850 and replace 4GB memory with 2 x 4GB Crucial 204 pin, DDR3, SO-DIMM PC3-8500 @ 1066. Description : AHCI Version 1.20 Supported. Do we foresee any issue of compatibility ? EVO850 should work on MCP79 at least 1.5Gb link speed, perhaps even get 3Gb link speed. It’s my experience: Kingston UV400 SSD work in SATA2 (3 Gbit/s) speed in my Mac Mini (Late 2009), OSX El Capitan. Crucial MX500 not work in SATA2 speed in these computer, just SATA1.